The business savvy know that no matter the catastrophe, there’s always a way to make money. 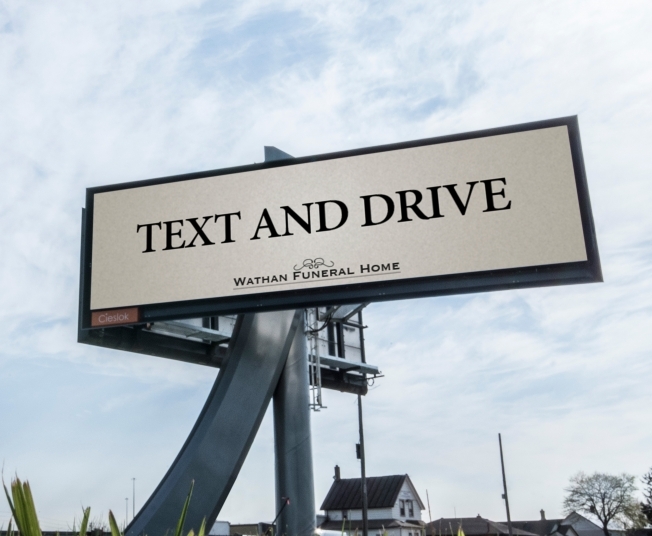 When a Toronto billboard for Wathan Funeral Home seemed to be encouraging people to text and drive to help drum up business for the funeral home, drivers were understandably enraged. If you’re here, you’ve probably seen our “Text and Drive” billboard. And if you have, you probably came to this website to tell us what horrible people we are for running an ad like that. And you’d be right. It is a horrible thing for a funeral home to do. But we’re not a funeral home. We’re just trying to get Canadians to stop texting and driving, which is projected to kill more people in Ontario this year than drinking and driving. That’s right. More. And while most people wouldn’t even think about drinking and driving, over half of Ontario drivers admit to reading texts while behind the wheel. That’s more than half of the drivers on the road today risking their lives, their passengers’ lives and the lives of their fellow motorists and pedestrians. The billboard was in fact a brilliant, albeit dark, marketing campaign to remind Toronto drivers what’s at stake when they choose to text and drive. Shock value marketing is nothing new but this campaign managed to do it without the blood and horror often used with a simple reverse psychology message. What a powerful reminder to stay safe behind the wheel.